What a perfect weekend in the gorgeous Blue Ridge Mountains of Virginia for a trail race. Personally it was beyond my expectations. As I was running the last mile feeling stronger than ever at the end of an ultra, I was thinking, what a gift from God this weekend was. I said aloud a prayer of thanks. Thanks for a healthy body that allows me to do this. Thanks for a beautiful day in such a glorious place. Thanks for David Horton and all the dedicated volunteers for putting on this wonderful event. Thanks for a loving family thinking of me. 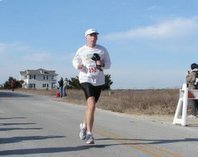 And thanks for all the great friends and fellow runners waiting for me at the finish and still on the trail behind me. What a feeling to cross that line and have so many people shake my hand and hug me as they offered their sincere congratulations. It doesn't get much better than to have the love and friendship of your peers. With 267 starters there are too many friends and acquaintances to mention but there were a few special things that deserve attention. It was great to watch Tammy Gray finish her 1st 50K and then to see the scary looking blisters she had endured. Marie Lewis finished her 1st trail 50K. Until she went to Rocky Raccoon in February she had never run on a trail and this was her 2nd time on a trail. She had never seen anything like these steep, rocky trails. Johnny Raney kept his streak of finishing every Promise Land alive with a gutsy finish after having serious knee injuries the past couple of years. I met Johnny at my very 1st Ultra in 2002 and he has always been very supportive of my running. Here is a link to a 6 minute video on you tube by Jeanne ?Craig and her husband. It sounds like you had a great time and you certainly ran a solid race. I'd like to get out to Virginia for a run one of these days. Thanks Curtis. I improved my course PR by 40 minutes. I guess the training plan is working. Hope you can make it up to NC or VA sometime. We have a lot of great races in beautiful places. Congrats Joey, as a beginner ultra runner here in Raleigh I have enjoyed reading about your experiences and reguarly turn to you blog. Thanks for the great posts and congrats on fantastic time you posted. Good luck with your continued prep for WS. You looked GREAT finishing up! I am thrilled you had a good day! I enjoy your reports and thank you for keeping me on the list. Saturday truely was a perfect "Promise Land" day...while on the very green horse trail I thought of golf courses! Hi Joey, Congrats on all your run accomplishments. I'm proud to have you as my cousin. I never knew you could sing? Great job!!! If you're in Durham any time in the future give me a shout and maybe we can hook up. Take care and good luck with your future runs.